the costumes are finished. finally. The good news is that the costumes and props are almost entirely sorted. I managed to finish the costumes this week and will have all the props ready by the end of next week. We won’t start filming till the end of August due to program staffing changes, but here’s hoping! So here are the costumes. I put them together for each character so that everything a person needs is on one hanger. Before looking, please remember I’m not a great sewer, not very neat and I make tons of mistakes. Plus I shortcut where I can. 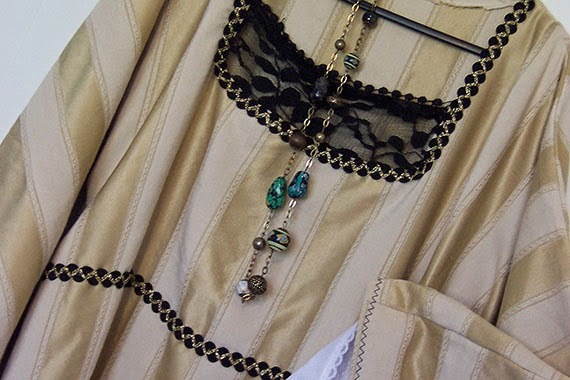 I made all costumes using fabrics, clothes, beads etc from op shops and donations from friends (and my own stash). 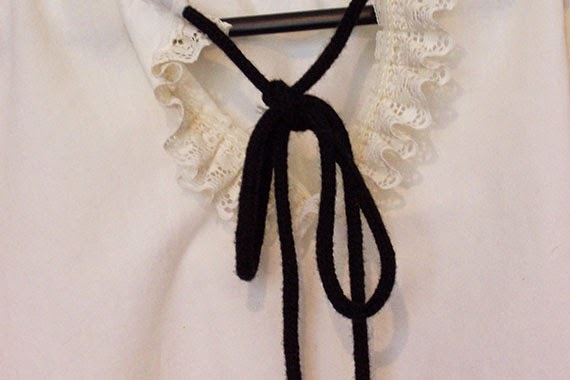 Ditto for trims, lace and props. Having warned you, this is the cook’s costume. 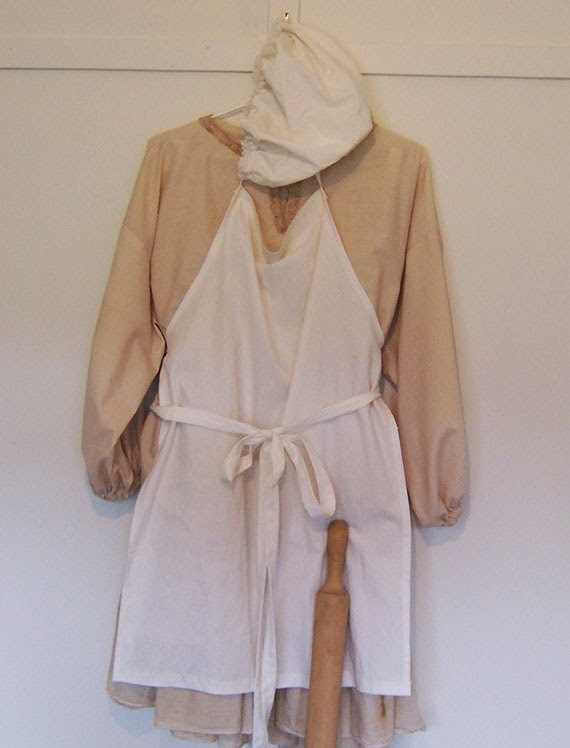 This comprises a plain white apron, a frilly white cap, a beige tunic and skirt. 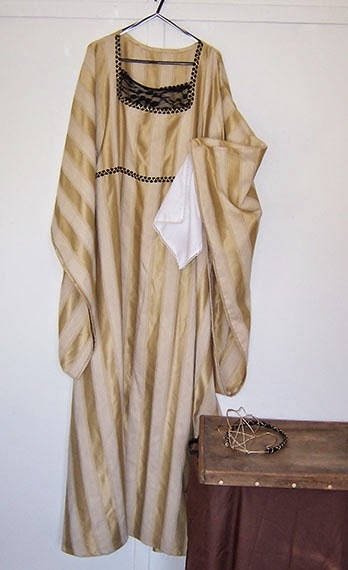 The tunic is one I made myself. The skirt is a tiered skirt I bought at an op shop. 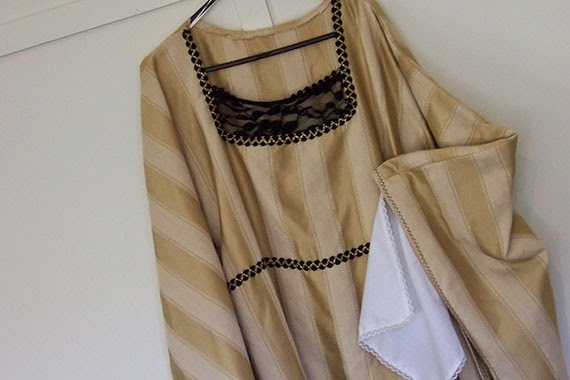 It was white so I dyed it using coffee so it matches the colour of the tunic. The point was to make the clothing darker than the apron and cap so they would stand out. No cook would be complete without a rolling pin so I’m lending one from my collection for the film. The cook is only in one brief scene at the beginning of the movie. Another small part is that of the guard. 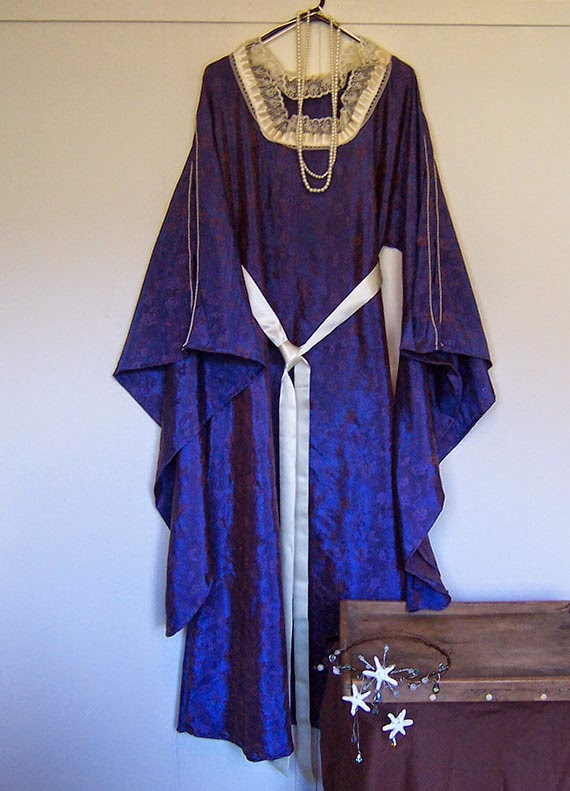 He’ll be wearing the grey tunic, black leggings, puffy pants, ‘boots’ and a blue cape we already had in wardrobe. 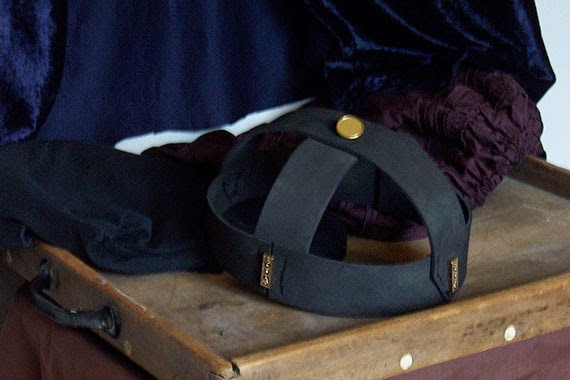 The guard will also be holding a staff when he guards the King’s chambers. Note: the kingdom where our story is set is a peaceful one (till evil makes an appearance) so there’s no need for weapons. 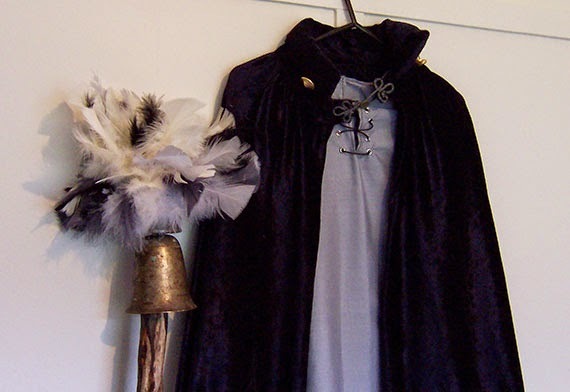 Therefore the guard holds a glorified feather duster instead of a sword. Wayne made the staff for another production and I repurposed it for ours. 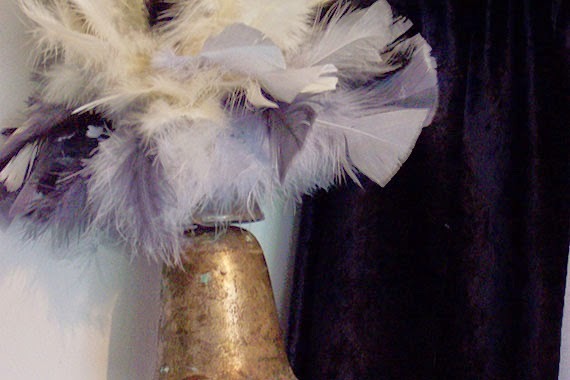 I created the feather puff ball using a styrofoam ball and used hot glue to stick feathers into it. I then glued it to the brass bell Wayne had attached to the large stick. All self respecting guards need a helmet, so our guard has one I made using a very thin foam sheet I found in the bottom of a shopping bag. I was about to throw it away when I realized it was the perfect material to make the helmet out of. 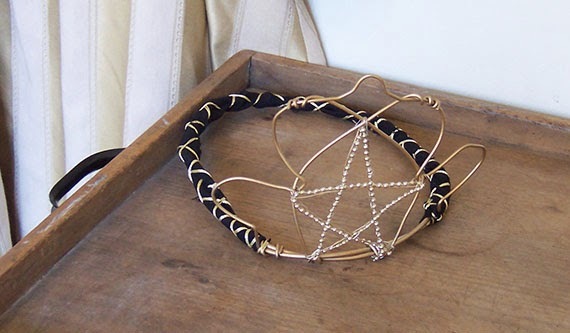 I used some metal beads used for hanging multiple strands together – they look like military insignia, and finished it off with a gold button on the top. There are 3 kings in our movie so I gave them each a colour to keep things easy to sort. The first king is King George. His main colour is brown. 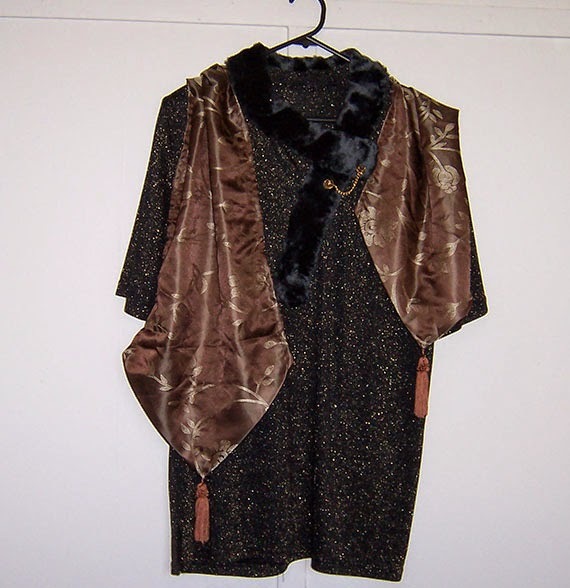 For his tunic I used a black top with gold strands through it and added a fur collar and a couple of gold buttons with a chain. 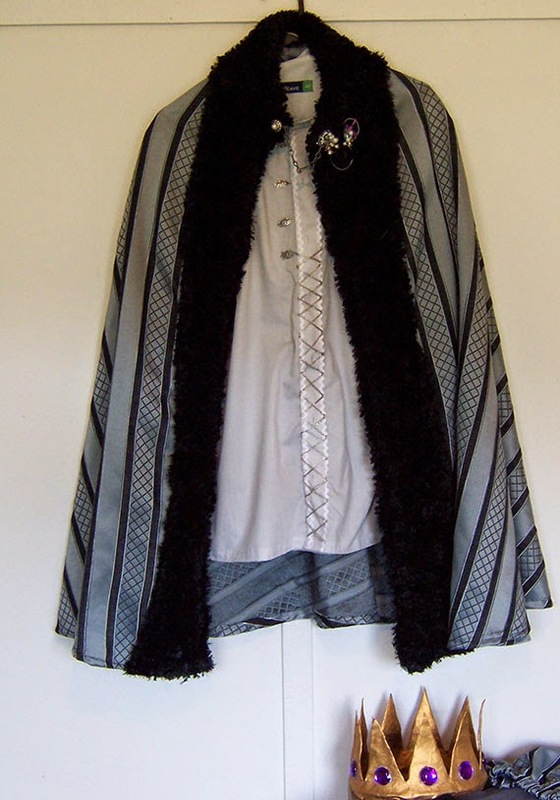 The shawl (a table runner!) 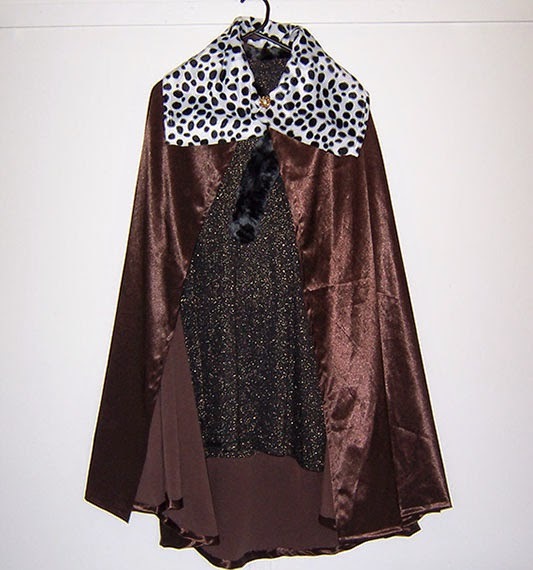 adds a dash of ‘je sais quoi’… although when he’s being more formal he’ll wear his cloak made of a shiny heavy brown fabric with a wide dalmation collar. 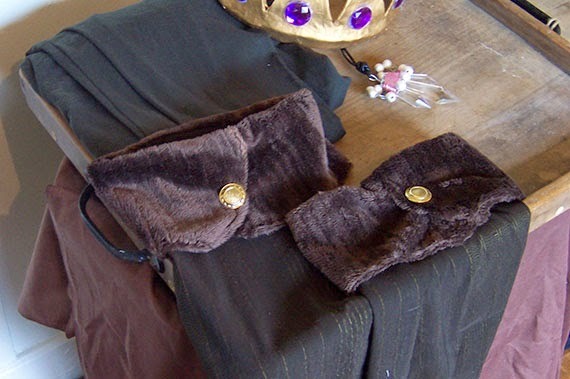 The costume is completed with brown leggings, brown ‘boots’, a crown and the ‘good magic crystal’. 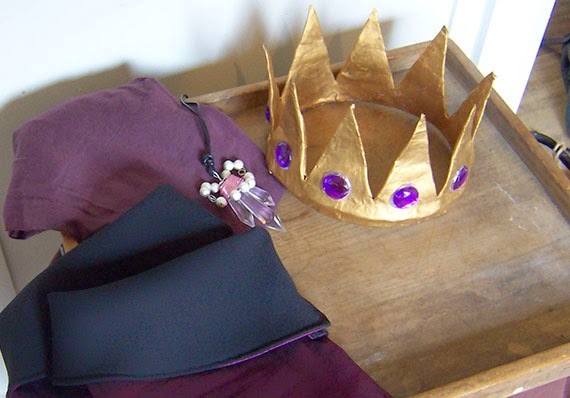 The crown is papier mache and rhinestones. The ‘good magic crystal’ is 3 chandelier crystals wired together with silver beads on a leather thong. 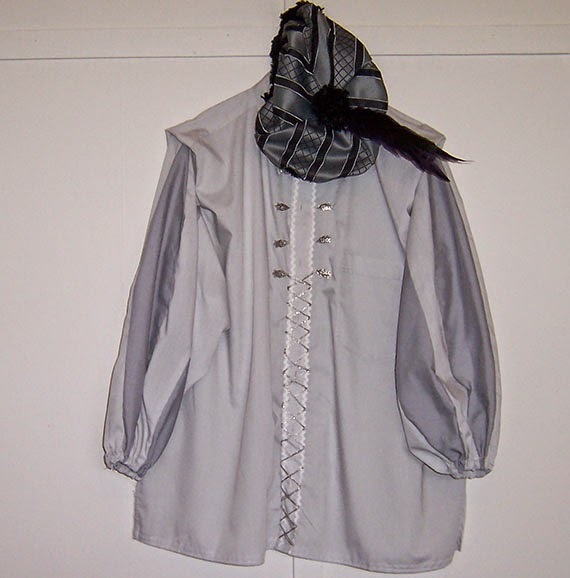 Next we have Prince Oscar… before he becomes a king, Prince Oscar wears a puffy sleeve tunic in 2 tones of grey. 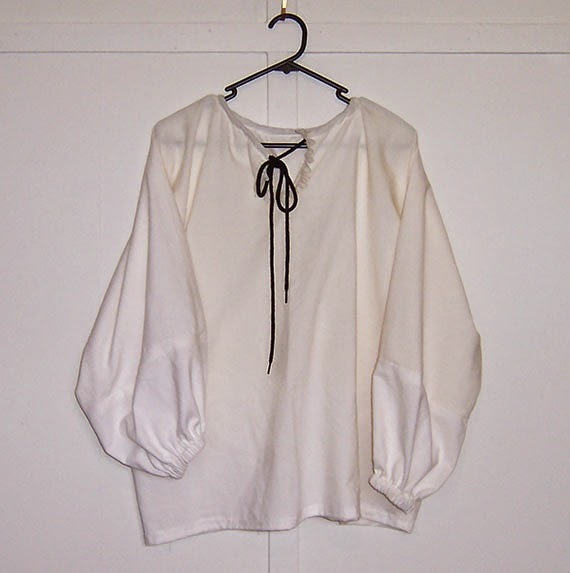 I used an old shirt and puffed the sleeves by adding in slices of extra fabric. I made some changes to the trim on the front of the shirt since I first posted about it. I removed the black laces and added silver decorations. It looks much better. Prince Oscar wears a silver cap with black and purple feathers, matching puffy pants, grey tights and black ‘boots’. When Prince Oscar becomes king he replaces the cap for the crown and wears his fur lined cape. Plus the ‘good magic crystal’. Of course. Lucy is a mermaid. Her costume couldn’t be blues and greens cause we’re using a green screen so I had to be imaginative. The top is something I found in an op shop. 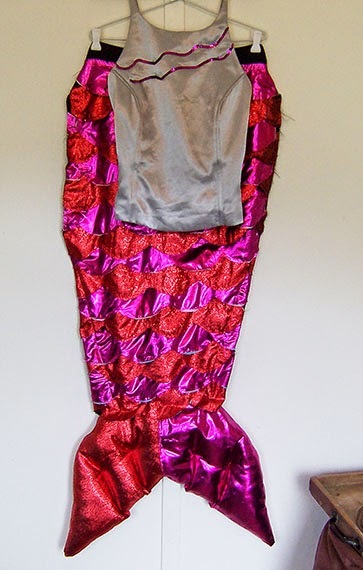 I added pink sequins to make it match the tail a bit. Since its too small I’ve added lacing at the back so we can adjust it to fit. The mermaid will only be seen from the front in our film. I’m the director. I decide how to film it! The tail was a bit of a challenge. I had to make something which was easy to make, easy to put on, easy to move around in, yet still look like a mermaid tail. 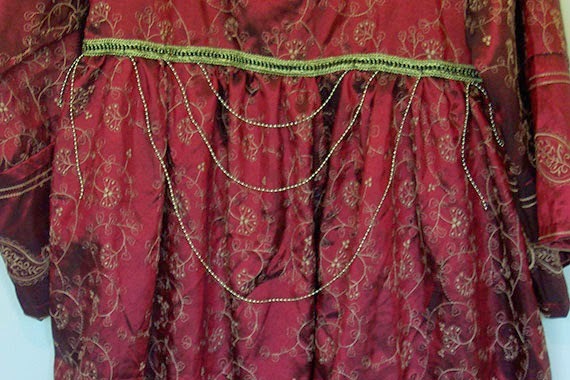 What I ended up doing is cutting red and pink fabric into scalloped strips to give them the look of fish scales. 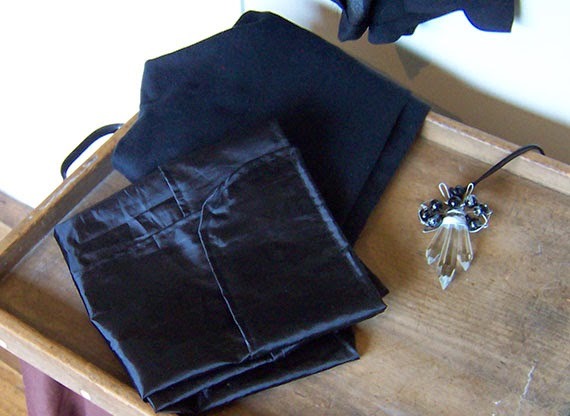 I then attached these to a black ‘apron’ of fabric. The apron tapers in towards the feet where it joins onto a tail which is stuffed with filling to give it body. 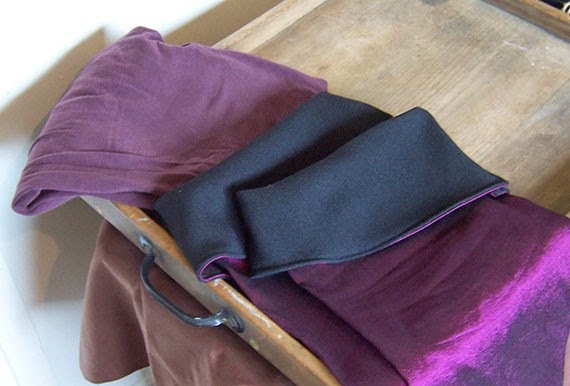 The tail ties on at the waist and has 2 large elastic loops which hold it in place against the legs. 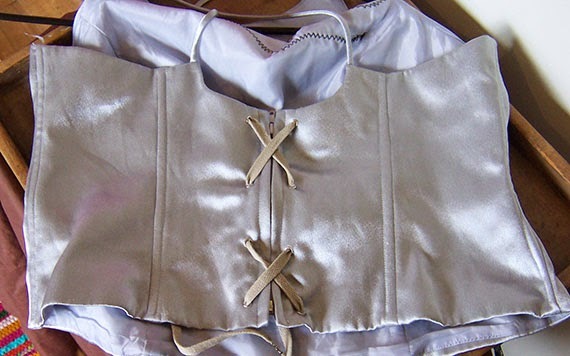 There is no back to the tail and will be worn with black leggings. 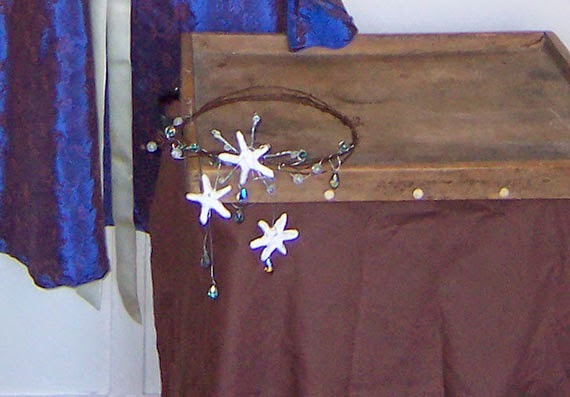 The mermaid has a great crown I made with brown florist wire, crystals, silver wire and starfish I made using a porcelain clay recipe I found on Pinterest. Sorry about the blurry photos. She’ll also have a magic wand (cause mermaids are magical creatures, at least in our story!). 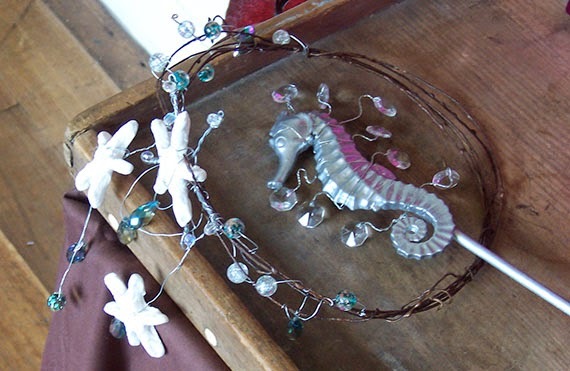 I made the want using a plastic seahorse, a bamboo stick, some wire and crystals. 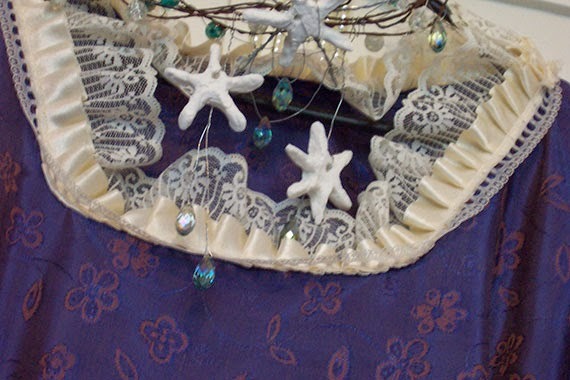 When Lucy the mermaid becomes human she’ll be wearing a gorgeous blue dress. I made this dress using the easy pattern I found on Pinterest, with the smoother armpit cuts. 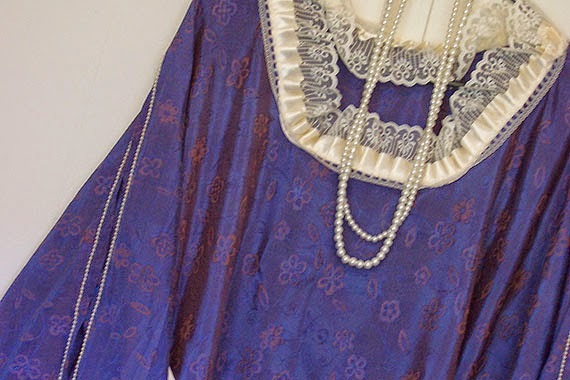 I absolutely love this dress, the colour is just beautiful and the lace and pearls on the sleeve are so pretty. When she’s human Lucy will still wear her mermaid crown, though she’ll add some pearl necklaces to her outfit. Another character who only appears briefly in the film is the peasant who leaves a baby at the castle gates. 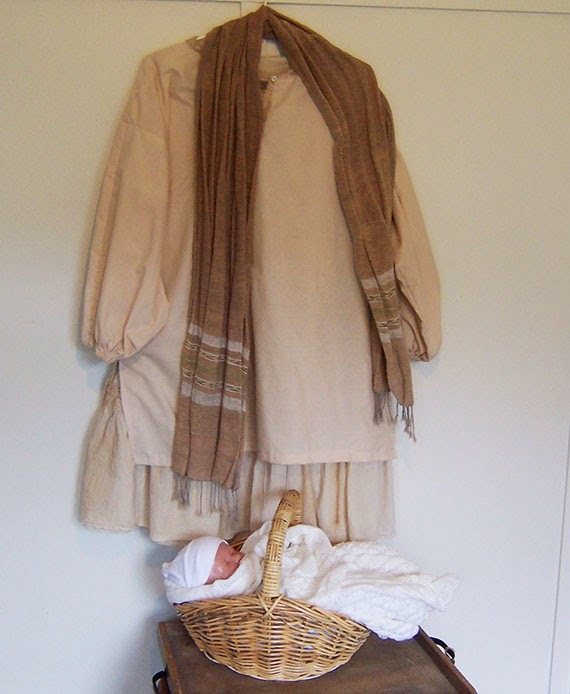 The peasant will be sharing the cook’s costume but, instead of an apron and cap, will be wearing a scarf I brought back from Greece wrapped around her head and partly covering her face and will carry a baby in a basket. There are two queens in the movie. 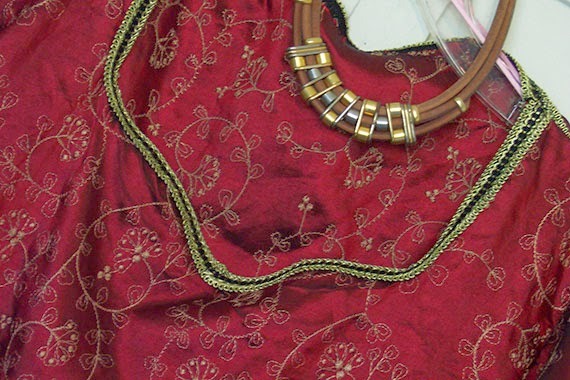 The first is Queen Mary who’ll be wearing a burgundy and gold dress trimmed with gold braid and gold beads. Made from an old doona cover. This dress wasn’t made the easy way. I didn’t have enough fabric to make this dress using the simple fold over and cut pattern. I had to make it the normal way which involves cutting a bodice, sleeves and skirt all separately and joining them together. It turned out quite well considering. Queen Mary will be wearing a gold necklace given to me by my friend Merrill. Only borrowing Merrill! And of course she’ll be wearing a crown. The wiring for the crown was done by Wayne. I finished it with the black and gold band and the gold beads. Queen Sophie’s dress was the first one I made so its made with the same easy dress pattern which involves cutting two pieces and sewing them together. None of the dresses have zips or buttons… Given that the waist measurements are wide enough to go over the shoulders there’s no need for them. Queen Sophie spends a lot of time crying so I made her a fine lacey hanky out of a scrap of white cotton and some lace. Then there’s the bad guy… He doesn’t start out bad. At first he’s just a normal guy. 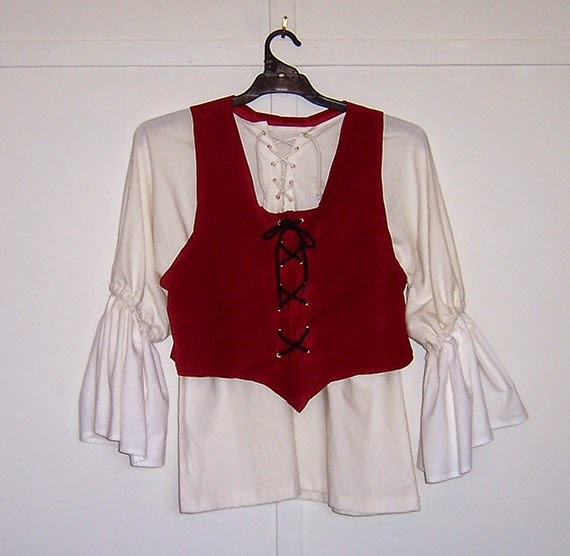 When he’s normal he wears an off-white gathered sleeve tunic with a red velvet vest. The tunic is made in the same simple way as the dresses but I didn’t have enough fabric to make the sleeves long so I added bits to it, hence the gathered sleeves. I made the vest without a pattern. I used a singlet to figure out the size and where to cut the arm holes and then just winged it. It actually looks great on. He’ll be wearing black leggings and black ‘boots’ both as a good guy and then as a bad guy. 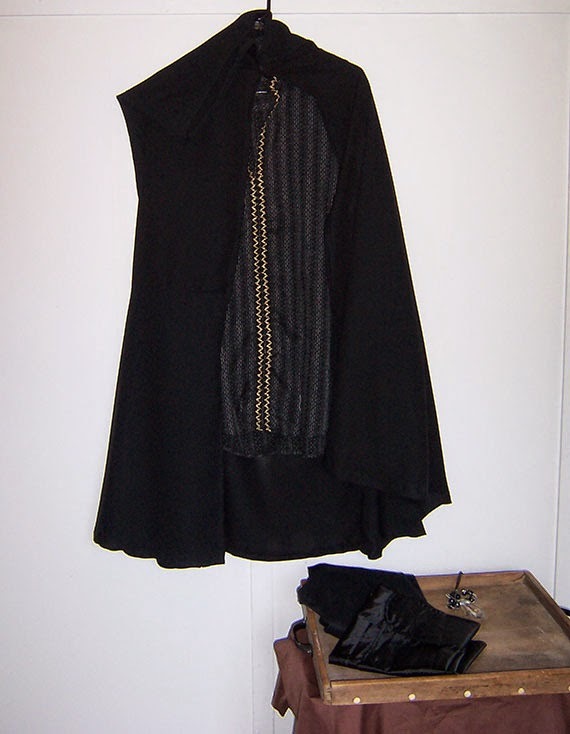 When he turns bad though he’ll wear a black tunic made from a black pin stripe shirt and a black cape. And he’ll have the ‘bad magic crystal’. Of course. Since the ‘bad magic crystal’ and the ‘good magic crystal’ are related they’re made in the same way using chandelier crystals, wire and beads, but whereas the good crystal is pink and silver, the bad crystal is black and silver. Then there’s Wallace. 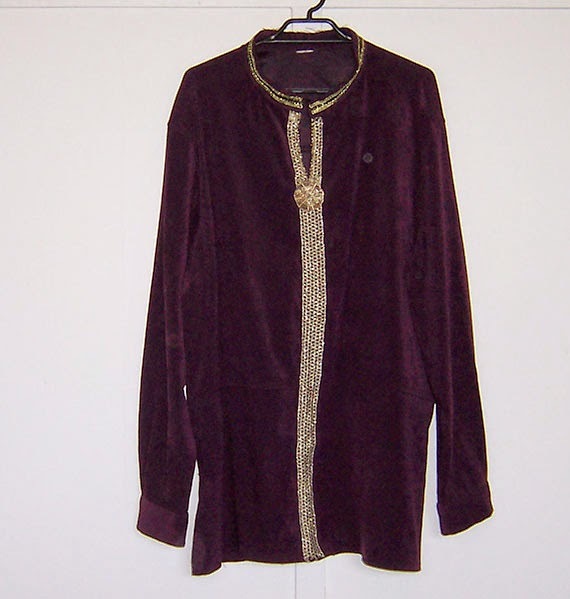 He starts out as a prince and wears a burgundy tunic trimmed with gold braid made from a velvet-look shirt. With this he wears burgundy leggings and black and purple ‘boots’. In case you’re wondering, the ‘boots’ I keep referring to in quotation marks are obviously not real boots. I’ve made these to be worn over the leggings and sit over the top of the shoes. The guys will wear black shoes and the boot tops should make it look like they’re wearing proper boots. 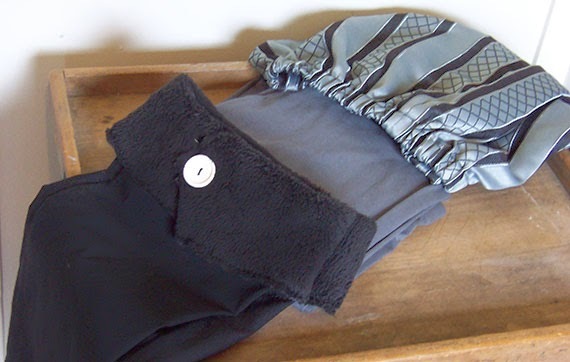 I made the first pair by cutting out fabric and folding it over at the top and adding velcro for attaching it. Instead, I bought stretchy pants from the op shop clearance rack, cut the legs off around knee high, added tops to them and voila… boots! Back to Wallace though. 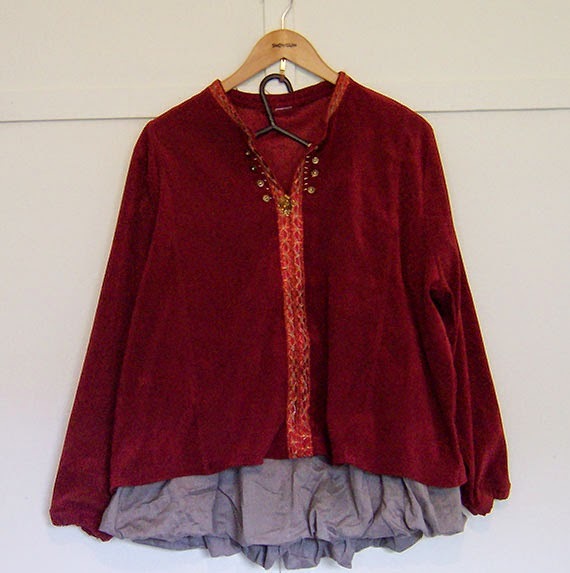 When he becomes king he’ll wear a shorter burgundy tunic (another velvet look shirt) and puffy pants. Only they’re not puffy pants… its a puffy skirt I found at the op shop which makes perfect puffy pants! 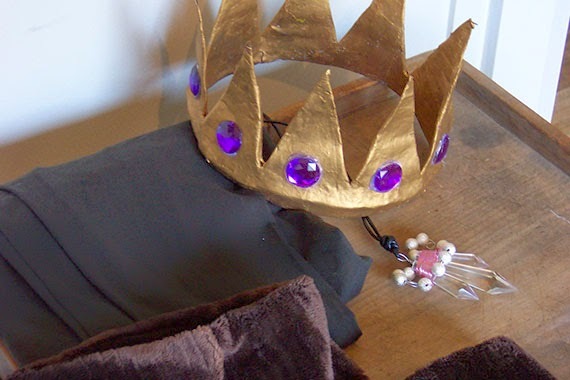 King Wallace will also wear the crown and have the ‘good magic crystal’. Lastly there’s the rabbit, Robert. When Robert is a human he’ll be wearing a white tunic, white pants and white shoes. He’s the cook’s son after all, a commoner, so nothing fancy for him. 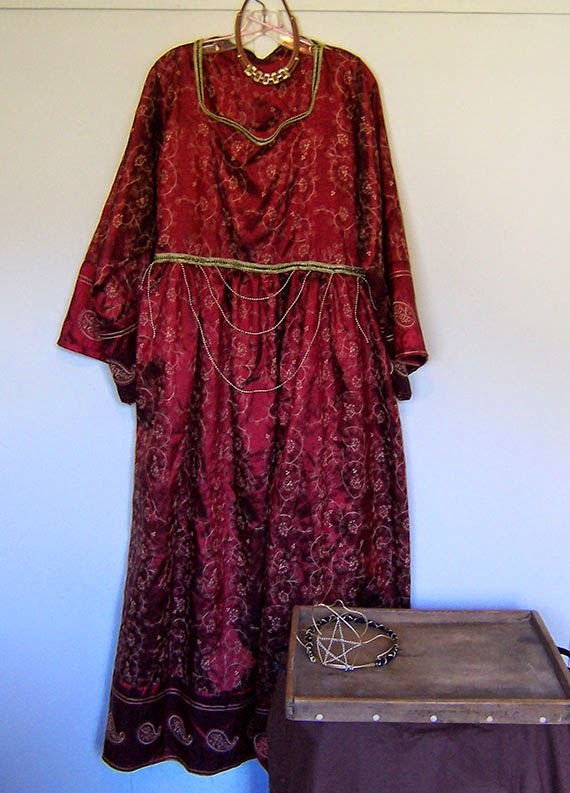 I made the tunic out of an old flat sheet and added a bit of lace and a black shoe lace to tie it at the neck. 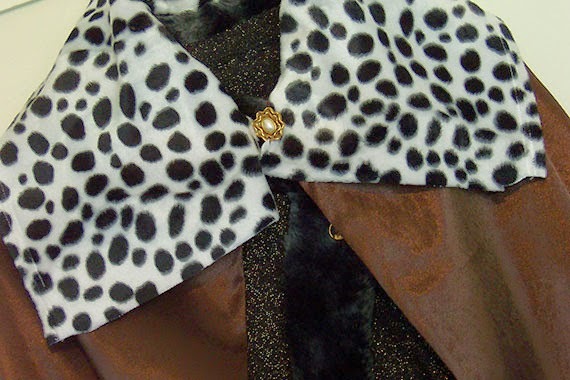 There wasn’t enough width to the fabric using the simplest pattern, so I had to add extra bits to the sleeves. 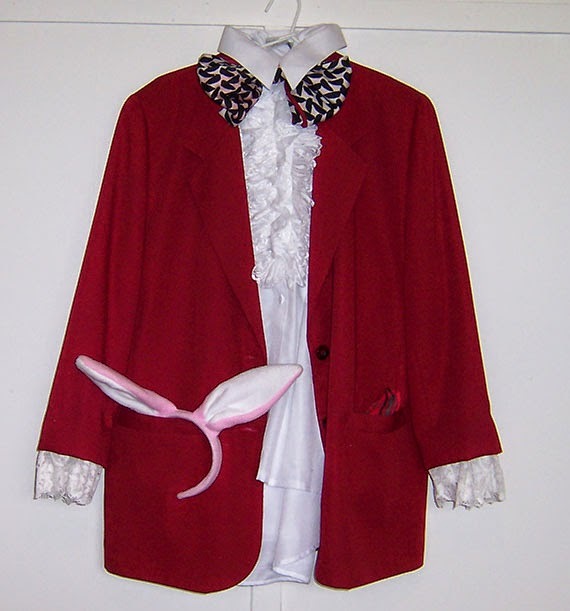 When Robert becomes The Wonder Rabbit he’ll be wearing the white pants and shoes, a frilly white shirt, a red jacket with lace at the sleeves, a large bow tie and rabbit ears. 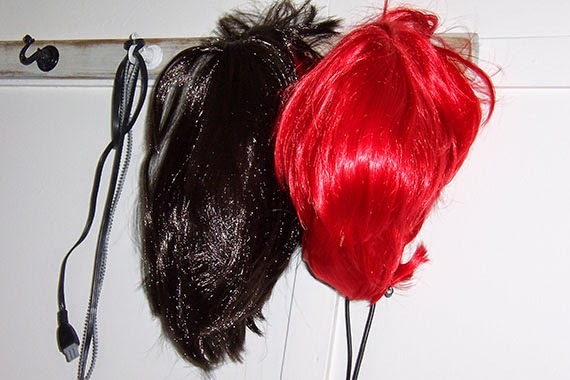 I have the wigs organised. Robert will be wearing the red wig. The short brown one will be shared by Prince Oscar and Prince Wallace as they’re not in any scenes together. King George and Oscar, when he’s older, will be sharing the white wig. The blonde wig will be worn by Lucy and the long brown wig will be worn by Queen Mary. The short black wig will be the bad guy’s wig. 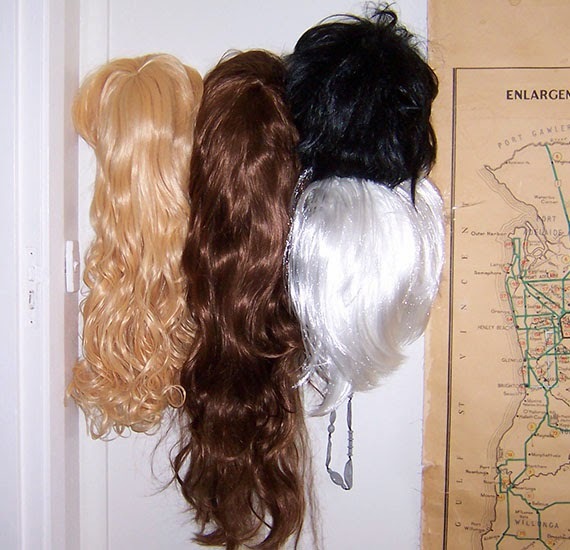 We have a couple more wigs which will be worn by Queen Sophie, the cook and the peasant.